Enjoy the vaulted ceilings that let in all the natural light. Patio off the living room to enjoy some fresh air. Front of the beach house townhouses. Unit A is on the left. Unit B is on the right. Enjoy the natural light and large windows that the main living area provides. Bright kitchen with granite countertops. 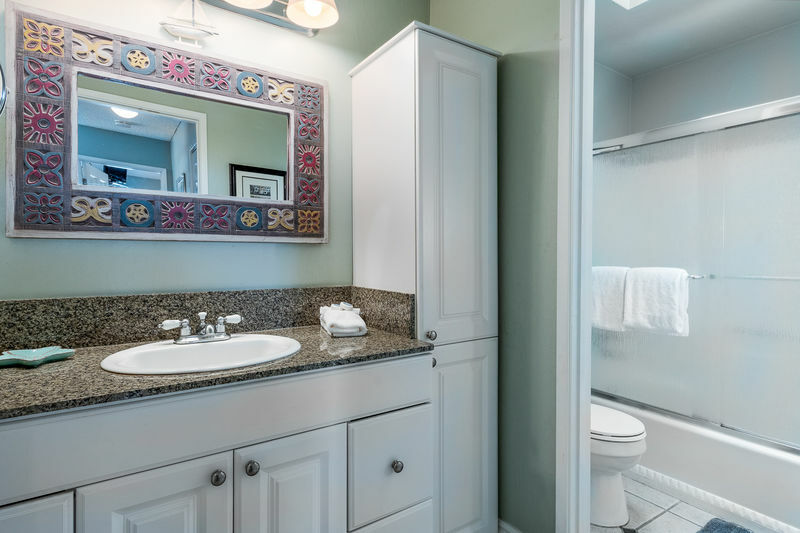 Walk out of the bathroom and into the Master bedroom where there is an extra sink to wash up. 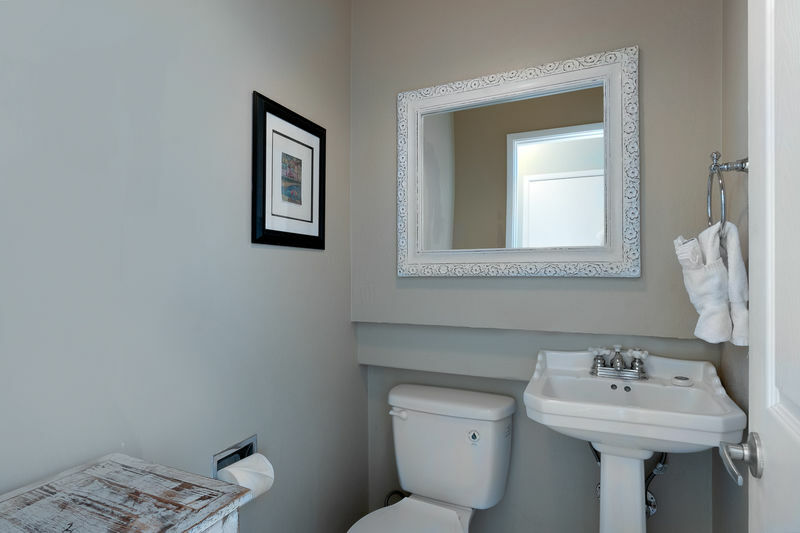 We love all the details throughout the home! View of the living room from the dining room. Enjoy a vacation at the Colorful Capitola Village Cottage! 2-night minimum in the off season. 3-night minimum in the Summer. Call 831-475-1808 or email us for inquiries and reservations. Brand new to the Beach House Rentals inventory of Capitola Village homes, spend your next family vacation at the Colorful Capitola Village Cottage unit A! This adorable and tastefully decorated 2-bedroom beach house sleeps up to 8 guests (and one small dog, too) throughout the home and will fit your group comfortably. This two-story vacation rental duplex is very spacious, which makes it perfect for your family or girls/guys getaway to the coast! With new hardwood floors throughout the entire beach house, you'll find everything you need in the comforts of this vacation rental. The coastal, beach-themed decor will bring your soul joy and refreshment while you are steps away to the beach. 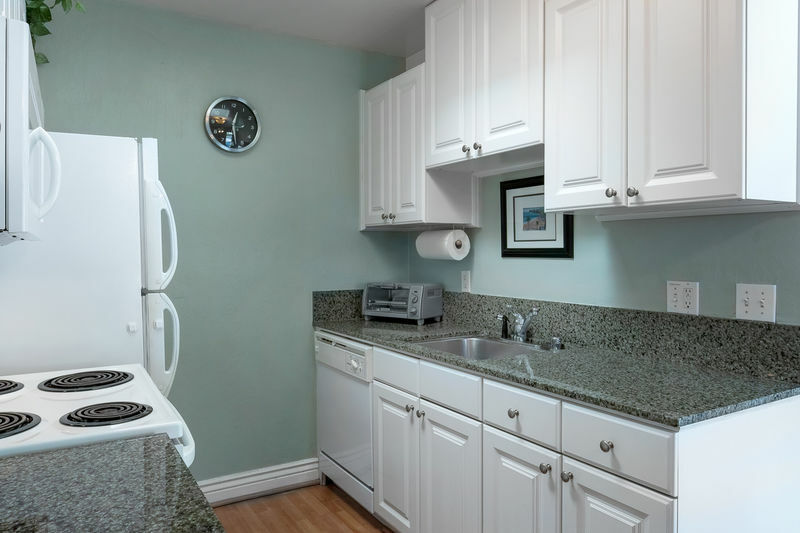 If you have a larger group and you want to be close to each other, then rent unit B! It is next door and has an identical set-up to unit A! Fabulous Location! 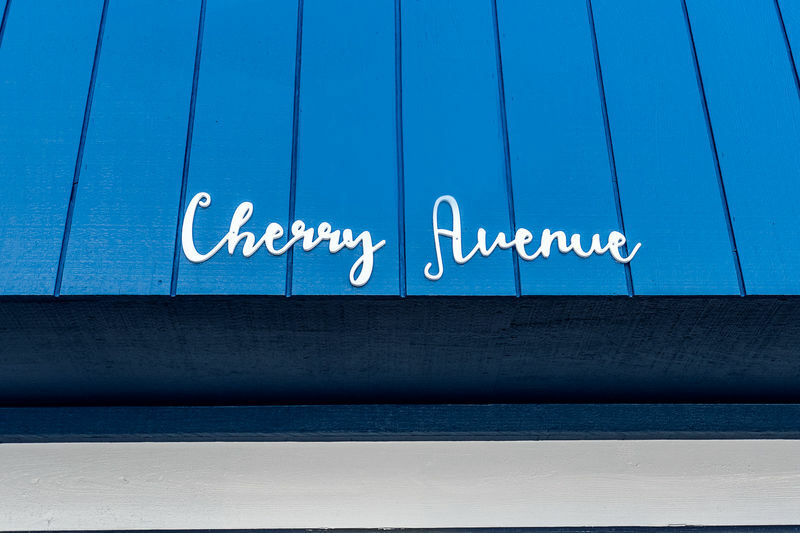 Located in the heart of Capitola Village by the Sea, named by Sunset Magazine as one of the 'best small beach towns in California" and 'among the top 20 small towns in the west'. Being located downtown Capitola Village and just one short block to walk to Capitola Beach, the restaurants on the Esplanade and shops in town, while you and your guests spend your vacation down at the beach or shopping in the Village, it is extremely convenient to go back to the property in between activities. Most guests who visit and stay in Capitola Village end up not needing to drive anywhere as everything is in easy walking distance of your beach house. This beach house comes with the convenience of a parking garage for one car, which is a huge bonus. It makes it simple to get in and out as you venture to Santa Cruz and the greater Bay Area throughout your stay. 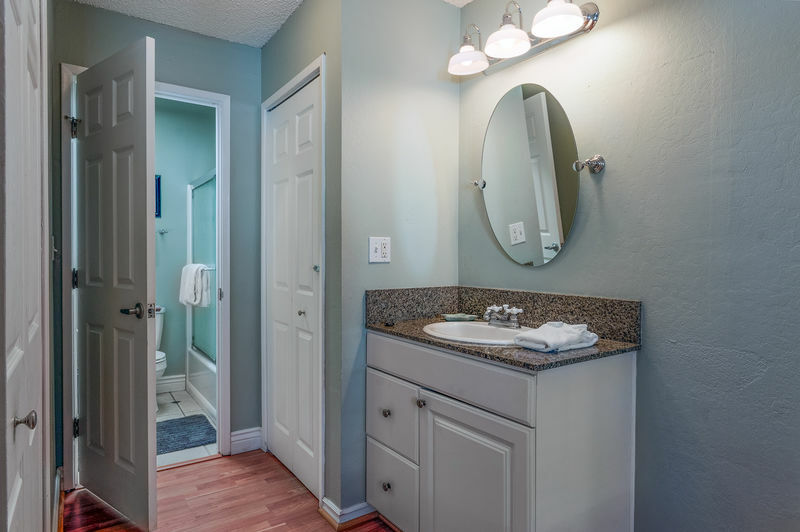 As you walk in the home (either from your front door or the garage), there is a half bath and first bedroom with 2 very comfortable full-sized beds and TV. Perfect for a kids room or two of your guests to enjoy a comfy bed to them selves. As you walk up stairs, you enter into the open floor plan with vaulted ceilings. The living room welcomes you with a new couch (that pulls into a queen sofa sleeper) and additional seating for your guests to enjoy watching some TV or your favorite movie or chat with your family and friends. There's a patio off the living room to offer some fresh ocean breeze into the home. There is room for 6 guests to sit around the dining room table. The kitchen is well-stocked with cooking utensils, pots and pans, dishware, glassware, coffee maker and Keurig coffee pot, too. The second bedroom has a very comfortable Queen sized bed and is also upstairs. There is a TV for you to watch shows in bed as you wish, too. The second bathroom with shower/tub combo is located upstairs as well. There are ceiling fans throughout the beach house, making warmer Summer nights even more comfortable for you to enjoy and relax! The multiple TVs throughout the beach house are a nice touch. There is a laundry room in the carport between unit A and B, which makes longer stays manageable for doing a load of laundry or two.